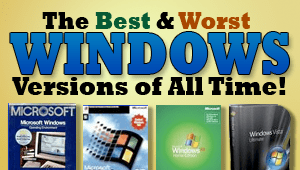 A week ago, I listed the major version of Windows that Microsoft has released over the past 23 years, summarizing their pros and cons and asking the Technologizer community to vote on the best and worst editions ever. The polls are now closed. And we have a winner–and a loser. And a couple of runners-up. None of them is exactly a shocker, but it was still a useful reality check. After the jump, a full report. The Best Windows Version of All Time: Windows XP SP2. A venerable bit of conventional PC wisdom has it that Microsoft never gets any product right until version 3.0. Maybe it’s clarifying, then, to think of Windows XP SP2, released in 2004, as Windows XP 3.0–the third major version of Windows XP after the original one and Service Pack 2. A lot of Technologizer readers think that Microsoft got Windows right with XP SP2, anyhow: It was the clear winner wen we asked you to name the best version, with forty percent of the vote. And its slightly-improved successor, Windows XP SP3, is so beloved that Microsoft is finding it hard to kill it. I’ve argued that the best versions of Windows are the minor ones, and SP2 was, on paper, a distinctly minor version. It added security enhancements such as the first halfway decent Windows firewall; an Internet Explorer pop-up blocker; various multimedia-related tweaks; improvements to Wi-Fi and Bluetooth support; and lots of bug fixes. But because SP2 was so mundane, it didn’t break things: Unlike, say, Windows Vista, it didn’t expect you to upgrade drivers or relearn much of anything which you already knew. All it was was a really highly evolved version of a reasonably stable operating system, and that was enough to make plenty of people happy. Runner-up: Windows 2000. Sixteen percent of survey respondents named Windows 2000 as the best version of the OS ever. Doesn’t surprise me: It was the first one that combined a familiar interface–namely one almost identical to Windows 95–with the robust technical underpinnings of Windows NT. When I dumped Win 98 for Win 2K, it was one of the biggest leaps in productivity I ever got from an OS upgrade. The Worst Windows Version of All Time: Windows Me. It was exciting. Advanced. And timely. According to Microsoft, that is. But Windows Me gained a crummy reputation with the home users it was aimed at almost as soon as it was released in September, 2000–one which dogs it to this day. 69 percent of the people who took our survey on the worst version of Windows ever named Me, a landslide by any definition. If Microsoft’s plans had panned out, Me–whose name was short for the instantly-dated “Windows Millennium Edition”–never would have existed at all. and the world might have been a better place. Windows 2000, which shipped in February of the same year, was originally supposed to replace both Windows 98 and Windows NT 4.0 and appeal to both consumers and business types. But Microsoft decided that the NT-based Win2K wasn’t ready for home users, so it postponed the merger of the home and business versions of Windows until Windows XP’s 2001 release. Windows Me, based on Windows 98, was whipped up so Microsoft would have a home-oriented upgrade for the 2000 holiday season. It was kind of like slapping a fresh coat of paint on a house you planned to tear down within months. Among the problems reported by Windows Me users were botched installations, incompatibilities with existing hardware and software, the refusal of IE to load pages, and shutdowns that didn’t result in Windows shutting down. Then there was the new System Restore feature and its tendency to restore viruses after you’d managed to remove them. Small wonder that PC World named Me as the fourth worst tech product of all time. True, even the smoothest rollouts in Windows history have involved glitches aplenty (and Apple’s OS X is hardly immune from them, either). But Me never got the service packs that might have eliminated most of its kinks. Instead, it was doomed to instant lame duckitude from the start. The best way to fix it turned out to be to replace it with the far superior Windows XP, which shipped just over a year later. Runner-up: Windows Vista. So much verbiage has been devoted to bashing Vista that you might come to the conclusion it’s the most-hated version of Windows to date. Not among our survey respondents: Eighteen percent of them named it as the worst ever, a distant second place to Windows Me. For Vista, that’s a victory: It’s despised by less than one-third as many respondents as the most-hated version of Windows. So there you go. Our voting definitely skewed towards reasonably recent versions of the OS, which makes sense since earlier versions of Windows weren’t used by anywhere near as many people as morerecent ones. (Windows 2.0 got no votes at all for either distinction, for instance.) I go back to Windows 3.0 myself, and didn’t participate in my own survey. But if I had, I might well have casted my votes for SP2 and Me. I think Windows Vista is the worst (though Windows ME was horrible, at least fewer people had to suffer it). – Microsoft has ZERO excuses for some of many flaws to Vista. My personal pet peeves are how truly horrible Vista is on laptops – especially around power management (well more specifically the ability to BLUE SCREEN & run down the battery while in “sleep” mode. – the by about 5 too many versions, especially the 32bit vs 64bit stupidity (a modern OS that can only handle 3GB of memory???) Versions that seemingly noone, not even MSFT can really explain (just what is so “Ultimate” about that version?) and the nuances of difference between “business” edition and others are baffling. I have used computers since the TRS-80 and Vista is, by far, the biggest step backwards in my day-to-day productivity I’ve every encountered. If I could get a Mac with a usable mouse device (a trackpoint which is the only good laptop mouse device IMHO) I’d get rid of my Vista laptop in a heartbeat. As it is I dread having to wake my laptop from sleep – it has, occasionally, taken me as long as 30+ minutes to get to a usable state and 5-10 minutes is pretty regular. I’m surprised, actually; WinME worse than Windows 1.0? I suppose not enough folks actually used those early versions to say. But Harry as far as ‘getting things right the third go-round,’ XP was version 1, XP SP1 was version 2, and XP SP2 was, in fact, version 3. So the rule holds, without any weaseling. And yet I’d say (from my vague recollections) that XP, the original release, was pretty darn good. MSFT did a good job all around with the XP release, considering they were migrating the Win9x code base with Win2K. And Win2K remains for me the best version of Windows ever, since I give XP extra demerits for introducing the horrible practice of activation. I loved Windows 2000 but XP drove me to Mac OS X Tiger (I had a bad case of spyware). I am on Leopard now at home but still use XP at work. I don’t mind it so much now – the service packs helped – but I have to change the theme from the default blue to silver in order to not feel like I am on a toy computer. I suppose that the reason XP SP2 is so popular is that it does what most of us want from an OS, and allows us to get on with our work with minimal interference. Vistas problems were, and continue to be manifold for the average user. Its still slow and clunky, getting in the way and flashing its bits and pieces at us, when all we want to do is get on with it. Perhaps someone will eventually learn that the best OS will be virtually invisible to the user, like the plumbing or electrical systems in a building, only visible where and when essential, otherwise, out of the way. There will always be those who want flashy colourful interfaces etc, but let them be an optional extra, like fluffy dice hanging from a car mirror. Windows XP SP2 was version 3.0, after the original and SP2? I think you meant to say that SP2 was version 3.0, after the original and SP1. Hmm… I’ve been using windows since v 1.0 and I must say that the best OS MS evere released for desktop use is NT4SP6a. XPSP2 is the absolute runner-up. NT4’s dilemma was lack of support for gaming but as pure OS it is outstanding. Windows XP is far better than Vista, and all talking about Vista is the more secure of them, is absolute rubbish! In Windows XP SP2 the “Software Restriction” policy built in with the basic function of disallowing an application to run. But a thing that a minority knows about is the fact that this module was developed by the same guy who made it for Vista. Another thing not so well known is that you actually are able to get the same functions from Windows XP SRP module but you’ll have to tweak the OS a little to get the functions. So you are actually able to run e.g. IE, Outlook or any other application process you feel for as anordinary user when you in fact are logged on as an administrator. However, I must say that shannonclark is absolutely right about the extreamly annoying explorer interface that MS made for Vista, don’t know what they were smoking on that dev. meeting. As you might understand I’m working as an Windows Engineer with several certifications regarding OS. I also been involved in testing programs (TAP) during different OS development, and the problem when MS developed Vista was the extreme focus on security and the total loss of focus on the UI. Let us not forget Windows 95. Without it, you would still be using….Program Manager. I personally think that Windows 98 SE is the greatest windows. In fact, I love 98 SE so much that I have it on my laptop, and plan on installing it on my desktop. ME is the worst, though. Correction: Windows NT 4.0 Workstation was actually the first NT OS to use the Windows 95 style interface, not Windows 2000.